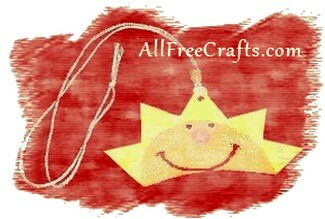 Make a sunny necklace for summer from recycled cardboard using our free printable pattern, craft paint and string. Print and cut out the sun pattern then trace it onto cardboard. The back of a cereal box would work very well. Put about 1 tablespoon of glue in a throw-away cup. Add yellow paint color and mix well. Use the colored glue to paint yellow onto the cardboard, following our photo. Sprinkle on the salt and tap any excess off, into the sink or garbage can. Repeat with the other colors. For the nose, drop some glue onto the pattern in a circular shape, sprinkle with salt and tap off. Or, if you have one, you could use a small pom-pom for the nose. Glue on the goggle eyes and draw a big smile. Make sure the string will go around your head. Fold it in half and, taking the loop, pull it through the hole, then pull the tails through the loop. Put the beads on both tails and knot at the top of the beads. Finally, place a knot at the top of the strings…and try on your sunny necklace!